Publish your article on the largest website for the eLearning niche reaching more than +647,000 eLearning professionals. 48,4% of eLearning Industry’s audience are C-Level professionals who are looking to source solutions for their business needs and stay up-to-date on the constant changes in the corporate eLearning industry. Our SEO experts will ensure that your sponsored article will be SEO optimized, as they already do for all eLearning Industry articles resulting in 80,6% organic traffic. 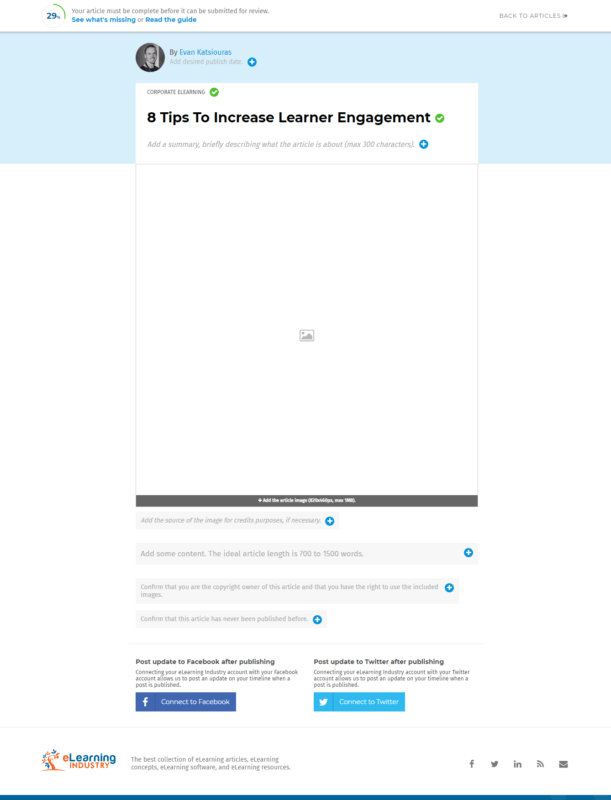 Build awareness & traction with your article front-and-center in the #1 eLearning newsletter globally! Benefit from your article being distributed to over 700.000 social media followers! Upload an original article of 1000-1500 words at least eight (8) business days before the Desired Publish Date (The author MUST also be the copyright owner of the submitted article). Add up to 1 rel="nofollow" backlink per 350 words (All backlinks are rel="nofollow"). Submit your article for Review (By submitting your article you give eLearning Industry full Editorial Control to review your article to make it error free, add a featured image, add subheadings and tags (if needed), format and break the text into smaller paragraphs/sentences to make it more legible). When the article is ready, we will publish it on eLearning Industry. Note: eLearning Industry retains the right to no-index a client's sponsored post if it starts competing with the website's non-sponsored content in organic search, 6 months after its launch date.